Whether you are creating a social media campaign, a viral video, or a traditional print ad, one thing has never changed: The importance of building your message around a consumer benefit. Consumers do not buy products and services, they buy the benefits they receive from them. Take Dove Soap, for example. For years, Dove advertised that its soap had ¼ cleansing cream, leaving skin soft. Dove didn’t become a top seller because it had ¼ cleansing cream, but because it made consumers’ skin softer. The cleansing cream’s formula was a merely one feature attributed to the product (also like saying “it’s white”). Soft skin was the soap’s ultimate benefit. Tip: You may need to describe your product and its details, but this isn’t the same thing as selling the benefits the product and its features deliver. For every product feature, you can almost always find a corresponding consumer benefit. 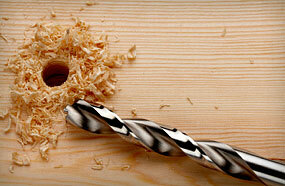 People don’t want to buy a quarter-inch drill. They want a quarter-inch hole. Don’t sell the tool, sell what it can do. Car companies understand this better than anyone, and you can see it in the way they differentiate themselves. Look at Volvo. Volvo sells cars with many features like electronic stability control and side airbags. But at the end of the day, why do consumers choose Volvo? Not for the specific features, but for the resulting benefit they offer. Volvo has spent years creating a brand around the benefit of safety. Volvo owners like the sense of security they receive when they tote their family around in one. So how does this translate to financial advertising? Banks and credit unions offer products like checking accounts with features like online bill pay and mobile banking. 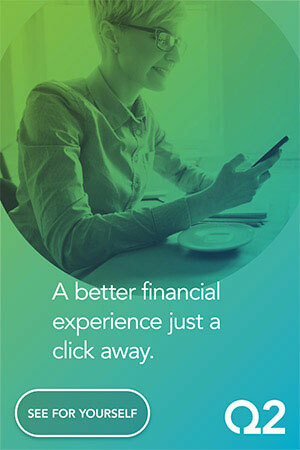 But consumers don’t choose a primary (or even secondary) financial institution for features like these. They will make decisions based on the benefits offered by these products and features. Tip: Consumers like to think they are highly rational beings, but they make every purchase decision for emotional reasons, then back their decisions up with logical justifications. You can’t persuade retail consumers with reasoning. You need to speak directly to their emotional hot buttons. Who hasn’t seen the commercial for Citibank with a young woman climbing to the top of a dizzying red rock formation in Utah’s Moab desert? Using the reward points from her Citibank ThankYou Card, she opts for the unexpected “rock” over the more predictable and cliché diamond that many advertisers might fall back on. Citibank is selling more than a credit card with rewards points. They are selling the idea of personal choice and a strong, independent lifestyle. The core underlying theme is “freedom”; people hate feeling trapped. People who relate to and aspire to these attributes are enticed by Citi’s offer at an emotional level. Another strong marketer in the financial arena is American Express. For decades, the card built its brand around a sense of status, belonging and inclusion. Some of us may remember the longstanding “Do You Know Me?” campaign, which featured celebrities ranging from dancer Mikhail Baryshnikov to puppeteer Jim Henson. Over the year, AmEx has incorporated celebrities into numerous campaigns, extending the concept to include small businesses with its Open Card. Small business card owners can feel that they are part of a community supported by American Express through such initiatives as ShopSmall.com. Consumers and businesses not only apply for the American Express card, but they are willing to pay higher fees for it. Why? For the feeling of self-satisfaction and pride they get when the own the card. A previously unknown Maasai herdsman appeared with Brazilian supermodel Gisele Bundchen in this ad for American Express bearing the headline “My card, my life.” Read more here. Georgia based LGE Community Credit Union recently launched a commercial with an opera-singing parrot. The commercial suggested that while this was one smart bird, banking at LGE was even smarter. Viewers who are penny-wise can feel good about their frugality and their decision in a financial institution when they bank at LGE. The underlying message addresses a key consumer fear: “I don’t want to look like a fool by doing anything stupid with my money.” The ad touts credit union features like better rates and fees as supporting points to help the audience rationalize their emotional choice. 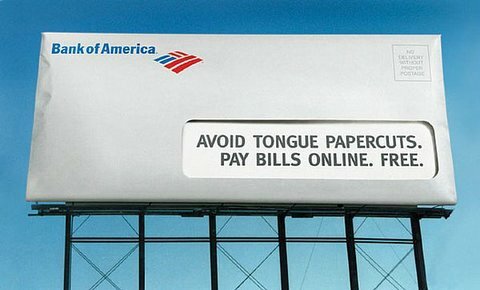 A billboard for BofA online banking product. Online banking offers consumers a variety of benefits, from saving time to saving stamps. But BofA found another to highlight, making for a memorable and very effective ad — some people just hate licking stamps and envelopes. One mistake that banks and credit unions often make is focusing their brand message on themselves rather than the consumer. How many ads for community banks have you seen that carry the message “We care” or “Focused on you,” or “Where you come first. “ But to the consumer, it’s all the same. Not only is today’s consumer cynical about advertisers and these types of messages, there is no tangible benefit for consumers. So rather than tell prospective customers that you care about them, why not simply demonstrate it with real, meaningful benefits? Ally illustrates these principles beautifully with consumer-centric product advertising. It’s obvious Ally conducts research to determine what annoys consumers about banking. Then the online bank responds with a creative product. Take the “Raise Your Rate CD.” People don’t want to feel like they got screwed out of a better deal that may be available in the near future. Giving customers one chance to “bump” their APY if rates improve alleviates this fear. Tip: Many of the emotional benefits consumers desire are some of the most basic, most powerful building blocks in human psychology — fear, greed, security, acceptance/belonging, anger, pride/esteem, pleasure, etc. Financial institutions are notorious for offering lists of features in their ads, expecting readers to intuitively understand what the benefit of each feature is — “It’s mobile banking. You know, mobile banking?? ?” That’s not to say that features like rates don’t play a role. We know that a low loan rate or a cash reward will entice a consumer if it’s good enough. After all, additional cash is a benefit in itself (greed). So think about the benefits your products provide. Do you offer exceptional convenience with your branch footprint or digital capabilities? Does the atmosphere and personal service you provide give your consumers a sense of belonging? Or do you offer products that save consumers time and generally make their lives easier? Find a way to communicate consumer benefits in your advertising. And you’ll find that your advertising generates greater results. Julie Burmeister is the President and Creative Director of The Burmeister Group, an Atlanta advertising agency who specializes in creating successful, memorable brands for financial institutions. This article was originally published on May 30, 2013 . All content © 2019 by The Financial Brand and may not be reproduced by any means without permission.